Prior studies suggests that parental characteristics such as age, occupation, maternal smoking during the perinatal period, maternal antenatal exposure to high altitude, and socio-economic status may be associated with an increased risk of craniosynostosis. ,, However, the results from studies investigating parental age as a risk factor for craniosynostosis have been inconsistent with some study finding an increased, , and others finding no increased risk. , There is no published study from India studying such an association in children with craniosynostosis. So, the purpose of this genetic epidemiologic study is to examine the association of parental age and educational level with craniosynostosis in Indian children using a case-control study design, and to study simultaneously the mutations underlying both the syndromic and non-syndromic craniosynostosis. Sixty children attending the pediatric surgery outpatient department with a diagnosis of suspected craniosynostosis from year 2007 to 2012 were studied. All had the characteristic features of craniosynostosis (moderate to severe ocular proptosis, shallow orbits, hypertelorism and mid face hypoplasia). All cases underwent computed tomography (CT) scan to verify the diagnosis. Venous blood samples were collected for genomic DNA extraction from peripheral blood leucocytes, using standard protocols. The coding exons IIIa, IIIb and exon IIIc of the FGFR2 gene, exon-5 of FGFRI gene were amplified by PCR with primers. The PCR products were sequenced from both directions with an ABI3730 Automated Sequencer (Xcelris Labs Ltd, Ahmedabad, India). The sequencing results were analyzed using Chromas (version 2.3; Technelysium Pty Ltd, Brisbane, QLD, Australia); they were compared with the reference sequences in the database at the National Center for Biotechnology Information (NCBI; NC_000010.10) and ENSEMBEL. One-hundred-twenty children attending the pediatric surgery outpatient department, and without any known birth defects served as "controls". After taking consent, parents of study subjects were given a personal and telephone interview to obtain information regarding parental and proband medical history, pregnancy and family history, and demographics. The parents were also examined clinically in syndromic cases. The study was approved by the Institute ethics committee. Statistical analysis was performed by using the SPSS for Windows, version 13.0 (SPSS, Chicago, IL). Chi-square (χ) 2 test was applied for the assessment of association in 2-dimensional contingency tables. Odds ratios (OR) and 95% confidence intervals (95% CI) were calculated to measure the relationship between a potential risk factor and case/control status. Descriptive statistics including percentage, mean ± standard deviation (SD) were calculated. Student t-test and Mann-Whitney U test were used for comparisons of continuous variables. Multiple logistic regression models were also used to test for interaction between various environmental risk factors. 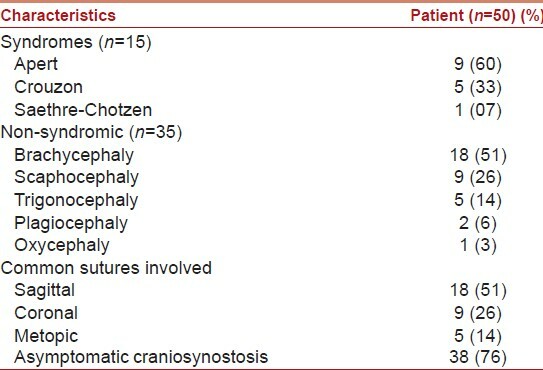 Out of 60 children attending the clinic, 50 children including 30 boys and 20 girls were confirmed to have craniosynostosis during the study period and were taken as "cases" [Table 1]. One-hundred-twenty "controls" formed the comparison group (ratio varying from 2.4:1 of controls to cases due to later exclusion of unconfirmed cases). Molecular analysis by sequencing confirmed following amino-acid substitution in different Exons of the FGFR2 gene (Exon IIIa - Ser252Phe, Ser252Phe, Pro253Arg, and Exon IIIc - Tyr105Cys, Ser267Pro, Trp290Arg, Trp290Gly) in syndromic craniosynostoses [Table 2]. None of these mutations were detected in children with non-syndromic craniosynostosis. We were unable to study mutation of the TWIST gene in the single case of clinically diagnosed Saethre-Chotzen syndrome. Besides these, we found other novel identical mutations in FGFR2 gene in both syndromic and non-syndromic craniosynostoses (Exon IIIa - Ser311Tyr, and Exon B - Thr392Thr) that have not been described previously in the literature. FGFR3 mutation testing was not carried out to look for other variants of syndromic craniosynostosis. No genetic study was undertaken in the parents. 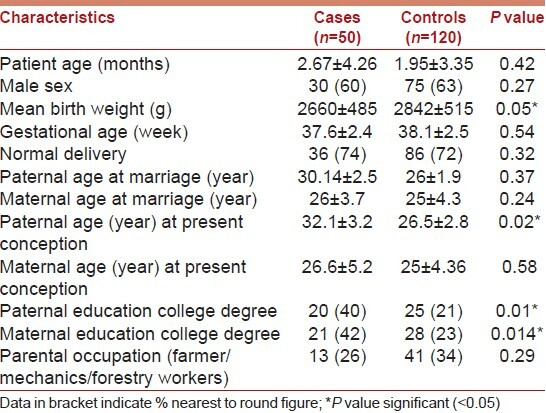 [Table 3] shows comparison of the demographic, educational and occupational factors between cases and controls. Except birth-weight, there was no difference between the two groups in regard to the mean gestational age and the mode of delivery. There was significant difference between the mean paternal (not maternal) age of both the groups at conception (P = 0.02). Control parents had less education than case parents. Forty percent of case fathers had a college degree or higher, while 21% of control fathers finished college. Forty-two percent of case mothers finished college, while 23% of control mothers had a college degree. Twenty-six percent of the case fathers were having occupation of either farmer/mechanics/forestry workers, whereas 34% of the control fathers had a history of the same. Multiple logistic regression analysis performed after adjusting for occupation and gender showed the association of craniosynostosis to be significant with advanced parental age, OR 2.17 (95% CI 1.08 to 4.36), maternal education, OR 2.32 (95% CI 1.2 to 4.76) and paternal education, OR 2.51 (95% CI 1.21 to 5.0). There is a paucity of study from India describing children with craniosynostosis (CS), but no published Indian study has studied the environmental and genetic risk factors. Few studies from outside India have studied these risk factors and the results are varied. Studies have found that, lower parental education level is associated with an increased risk of craniosynostosis. , But, a study from USA has found a decreased risk of CS with parental education [maternal education, OR 3.3 (95% CI 1.56 to 6.98); paternal education, OR 4.39 (95% CI 2.06 to 9.34)]. However, other studies do not support this by demonstrating no association with parental education. ,, The possibilities could be simultaneous association with late marriage and increased age at conception or through certain occupational exposures or lifestyles. Moreover, increased awareness among educated parents could be an additional factor showing this association. This is because of an increased medical attention. Further research is needed in this area, as it is hard to explain any direct association of craniosynostosis with higher parental education. An increased risk of craniosynostosis has also been found to be associated with advanced parental age. Some found an increased risk with advanced maternal age, ,, whereas others did not. , The relationship between paternal age and craniosynostosis risk is less clear. One study identified advanced paternal age as a risk factor,  whereas others did not. , Any risk associated with advanced parental age may be a risk factor for coronal synostosis, but not sagittal or metopic synostosis. , The explanation for advanced paternal age is its association with increased DNA mutations and chromosomal aberrations in sperm, and an increased frequency of genetic abnormalities in the embryo. Due to the increase in DNA mutations in sperm, older men are at higher risk of fathering children with autosomal dominant genetic disorders like craniosynostosis. The relationship between advanced paternal age and higher parental education may be linear rather than mutually exclusive, as one is commonly associated with the another and vice-versa. This is supported by findings from previous, as well as our study. No published study from Indian has specifically reported about the genetic sequencing in a large number of patients with craniosynostosis. By this study, in addition to the previously detected mutations in different Exons of the FGFR2 gene described above, we also found other novel identical mutations in FGFR2 gene in both syndromic and non-syndromic craniosynostoses cases (Exon IIIa - Ser 311 Try, and Exon B - Thr 392 Thr). The latter would help in further expansion of genotype of both the syndromic as well as non-syndromic craniosynostoses and would help in parental counseling. An exclusive paternal origin of mutations, and increased paternal age, has been previously described for different de novo mutations of the FGFR2 gene causing Apert, Crouzon and Pfeiffer syndromes. Further research should evaluate if the new mutations detected above have any relation to advanced paternal age, or have an exclusive paternal origin. 1. Glaser RL, Jiang W, Boyadjiev SA, Tran AK, Zachary AA, Van Maldergem L, et al. Paternal origin of FGFR2 mutations in sporadic cases of Crouzon syndrome and Pfeiffer syndrome. Am J Hum Genet 2000;66:768-77. 2. Mettler G, Fraser FC. Recurrence risk for sibs of children with 'sporadic' achondroplasia. Am J Med Genet 2000;90:250-1. 3. Boulet SL, Rasmussen SA, Honein MA. A population-based study of craniosynostosis in metropolitan Atlanta, 1989-2003. Am J Med Genet A 2008;146A:984-91. 4. Bradley CM, Alderman BW, Williams MA, Checkoway H, Fernbach SK, Greene C, et al. Parental occupations as risk factors for craniosynostosis in offspring. Epidemiology 1995;6:306-10. 5. Kallén K. Maternal smoking and craniosynostosis. Teratology 1999;60:146-50. 6. Lajeunie E, Le Merrer M, Bonaïti-Pellie C, Marchac D, Renier D. Genetic study of nonsyndromic coronal craniosynostosis. Am J Med Genet 1995;55:500-4. 7. Alderman BW, Fernbach SK, Greene C, Mangione EJ, Ferguson SW. Diagnostic practice and the estimated prevalence of craniosynostosis in Colorado. Arch Pediatr Adolesc Med 1997;151:159-64. 8. Taylor L, Tooth I. Craniosynostosis in NSW. Public Health Bull 1993;4:113-6. 9. Carmichael SL, Rasmussen SA, Lammer EJ, Ma C, Shaw GM; National Birth Defects Prevention Study. Craniosynostosis and nutrient intake during pregnancy. Birth Defects Res A Clin Mol Teratol 2010;88:1032-9. 10. Rasmussen SA, Yazdy MM, Carmichael SL, Jamieson DJ, Canfield MA, Honein MA. Maternal thyroid disease as a risk factor for craniosynostosis. Obstet Gynecol 2007;110:369-77. 11. Zeiger JS, Beaty TH, Hetmanski JB, Wang H, Scott AF, Kasch L, et al. Genetic and environmental risk factors for sagittal craniosynostosis. J Craniofac Surg 2002;13:602-6. 12. Reefhuis J, Honein MA, Shaw GM, Romitti PA. Fertility treatments and craniosynostosis: California, Georgia, and Iowa, 1993-1997. Pediatrics 2003;111:1163-6. 13. Singer S, Bower C, Southall P, Goldblatt J. Craniosynostosis in Western Australia, 1980-1994: A population-based study. Am J Med Genet 1999;83:382-7. 14. Green RF, Devine O, Crider KS, Olney RS, Archer N, Olshan AF, et al.National Birth Defects Prevention Study. Association of paternal age and risk for major congenital anomalies from the National Birth Defects Prevention Study, 1997 to 2004. Ann Epidemiol 2010;20:241-9.